Tony Campbell scored a career-high 27 points and grabbed 13 rebounds to lead Ohio to a 79-73 home victory over Ball State. Campbell, the Bobcats’ starting center, sank four of his six 3-point attempts to help gain the Green & White’s first Mid-American Conference win of the season. Campbell wasn’t the only Bobcat to notch a double-double on Saturday afternoon. Jaaron Simmons finished with 21 points, 11 rebounds and six assists. Treg Setty added 11 points in the victory. Francis Kiapway led the Cardinals’ offense with 21 points, including six 3-pointers. Ryan Weber recorded 11 points. Trey Moses and Bo Calhoun both tallied 10 points in defeat. 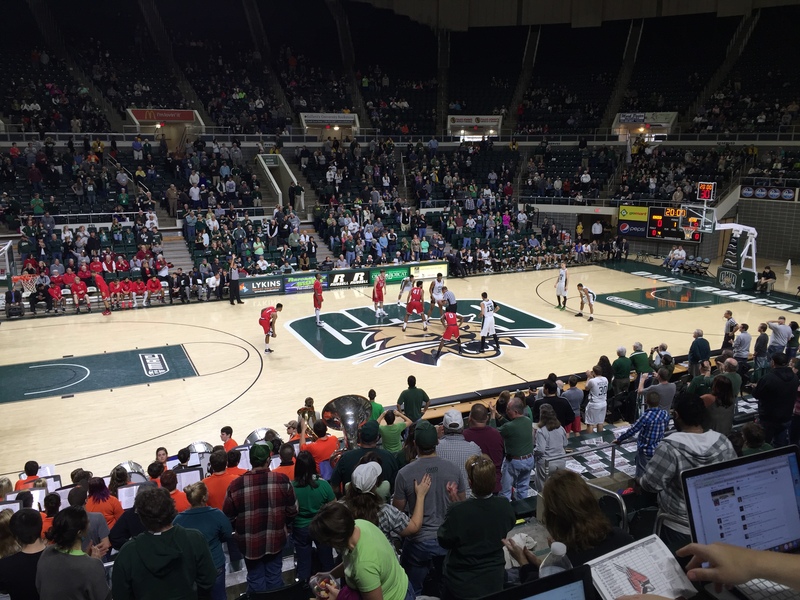 Ohio (10-4, 1-1) trailed 39-33 at halftime but took just 64 seconds to level the score. The Bobcats made half of their shots in the second half after shooting at 35 percent in the first half. “We became more aggressive,” Campbell said. “We started attacking the rim more. Ohio held a 40-29 rebounding advantage over Ball State (10-5, 1-1). Ten offensive rebounds led to 17 second-chance points for the Bobcats. “I’d like to be the first to congratulate myself on back-to-back 10-win seasons,” Phillips said after the game. Ohio earned its tenth win of last season on March 6. The Bobcats early success seems to be contagious in the MAC. Only two teams, Miami and Western Michigan, find themselves below .500 as conference play picks up. Phillips likened the conference to the gridlock that can be found on U.S. Route 33. Ohio freshman Gavin Block left the game late in the second half after injuring his left knee while taking off for a fast break layup. Coach Phillips said Block will undergo evaluation, but it seems to be less serious than it initially appeared.